Learning is essential and life-long. Yet as these authors argue convincingly, people often use exactly the wrong strategies and don't appreciate the ones that work. We've learned a lot in the last decade about applying cognitive science to real-world learning, and this book combines everyday examples with clear explanations of the research. It's easy to read and should be easy to learn from, too!--Daniel L. Schacter, author of "The Seven Sins of Memory"" This is a quite remarkable book. It describes important research findings with startling implications for how we can improve our own learning, teaching, and coaching. Even more, it shows us how more positive attitudes toward our own abilities and the willingness to tackle the hard stuff enables us to achieve our goals. The compelling stories bring the ideas out of the lab and into the real world.--Robert Bjork, University of California, Los Angeles" If I could, I would assign all professors charged with teaching undergraduates one book: "Make It Stick: The Science of Successful Learning" It lays out what we know about the science of learning in clear, accessible prose. Every educator--and parent, and student, and professional--ought to have it on their own personal syllabus.--Annie Murphy Paul"The Brilliant blog" (02/07/2014)" If you want to read a lively and engaging book on the science of learning, this is a must Make It Stick" benefits greatly from its use of stories about people who have achieved mastery of complex knowledge and skills. Over the course of the book, the authors weave together stories from an array of learners--surgeons, pilots, gardeners, and school and university students--to illustrate their arguments about how successful learning takes place This is a rich and resonant book and a pleasurable read that will leave you pondering the processes through which you, and your students, acquire new knowledge and skills.--Hazel Christie"Times Higher Education" (04/03/2014)" Many educators are interested in making use of recent findings about the human brain and how we learn Make It Stick" [is] the single best work I have encountered on the subject. Anyone with an interest in teaching or learning will benefit from reading this book, which not only presents thoroughly grounded research but does so in an eminently readable way that is accessible even to students.--James M. Lang"Chronicle of Higher Education" (04/23/2014)" Aimed primarily at students, parents, and teachers, Make It Stick" also offers practical advice for learners of all ages, at all stages of life With its credible challenge to conventional wisdom, Make It Stick" does point the way forward, with a very real prospect of tangible and enduring benefits.--Glenn C. Altschuler"Psychology Today" (04/10/2014)"
Accelerated Learning Techniques for Students: Learn More in Less Time! Liked the solid science based approach and explanation of techniques, except for the chapter about IQ which didn't seem so solid with empirical research and more based on wishful thinking about the intelligence potential being more or less equal between us all. In saying that I agree that we can all maximise what we are given genetically using the fantastic techniques within the book. Very practical approach to learning so that out kids are not having to work it out on the fly by themselves. The format of the book is true to the message! And the message is robust, the delivery lively, and the content evidence based. From reading this book I got a good idea of the most effective strategies for learning. It was also interesting how many of the learning techniques and ideas commonly held are misplaced. An example of one misplaced but commonly held idea is that there are different types of learners based on sense (e.g. 'visual learners'). This book is what I have been waiting for. Solid and very useful ways to improve ones learning habits. No mambo-Jambo talk and fairy-tales. Very down to earth and useful advices. Great! 4.0 out of 5 starsThere's How You Think You Learn, and There's How You Learn! Okay, well maybe I am overstating that a little. 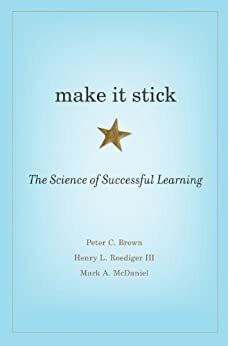 But the main "thesis" of Peter Brown's book - aside from being a summary of what cognitive science data shows about how we learn - is basically that many of the things we often assume about learning are wrong. Here are some of them: we learn best by reading and rereading a passage until we really understand it. WRONG! We learn best when we isolate a skill and practice it over and over again. WRONG! We all have learning styles that are the way we learn best. WRONG! IQ (or something like it) imposes relatively firm limits on how much information we can absorb. WRONG! Another myth? While we all certainly have learning preferences (I like to receive my information in written form), that doesn't mean we learn best when receiving information in that form (I can do as well when I receive information audibly as when it is written, even though I prefer the latter). Brown reviews literature that shows that, at least as of now, there is no evidence that shows that how one receives information substantially affects how well we learn the material (after all, hearing or reading a phone number is immaterial to what i am remembering: not the sound or sight of the number, but the number itself). But what they do find is that whether one is an "example learner" or a "rule learner" does have an impact in how well one learns. That is, those who see and practice a math problem and are able to see what the rules are behind the example and commit the rule, rather than the example, to memory will tend to learn better. Also, another factor that affects how well we learn is our mindset, whether we learn for mastery or learn for performance. Those who learn for performance - so that they can show how good they are - tend to tackle learning new things (things that might make them look bad) with trepidation, but those who learn for mastery aspire to acquire new skills openly, without regard to whether they will fail before mastering. These are just some of the lessons from this book. Whether you are a student, teacher, professor, coach, trainer, or any other professional whose job entails teaching others, this is a good book to have. (I'm a professor in a College of Education, and I definitely plan on allowing what I've gleaned from this book to inform my practice.) It is quite informative not only by way of learning theory, but backs up the theory with both empirics and suggestions for practice. Good one. 556 people found this helpful. 5.0 out of 5 starsThe book is packed with Big Ideas. We write for students and teachers, of course, and for all readers for whom effective learning is a high priority: for trainers in business, industry, and the military; for leaders of professional associations offering in-service training to their members; and for coaches. We also write for lifelong learners nearing middle age or older who want to hone their skills so as to stay in the game. Want to learn about the science of successful learning? Then this is the book for you. Make It Stick is written by story-teller Peter Brown and two leading cognitive scientists who have spent their careers studying learning and memory: Henry Roediger and Mark McDaniel. It’s a fascinating exploration of what science says about the most effective learning techniques— shining light on the techniques that actually work and those that do not work—even though we may think they do! Hint: Rereading, massed “practice-practice-practice” sessions, and cramming are not wise strategies. Active retrieval, interleaving, spaced repetition, reflection, elaboration, getting your mind right and practicing like an expert, on the other hand, are very good strategies. 1. Fluency vs. Mastery - Don't just go w/your feelings. 2. Cranberries + Testing - Active retrieval is where it's at. 3. Curveballs - Interleave yourself some curves. 4. Elaboration - Explain it like I'm 5. 5. Testing - Static vs. Dynamic. To optimizing and actualizing and making it stick! 63 people found this helpful.